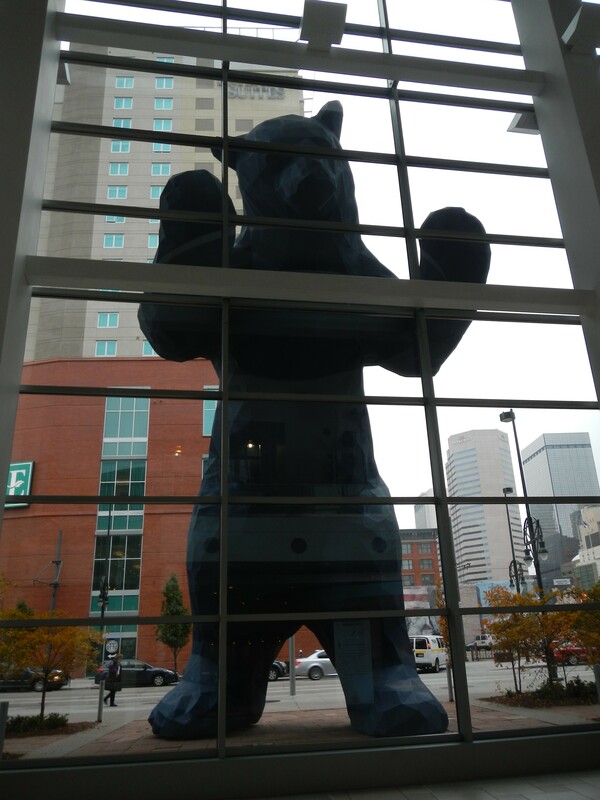 Big Blue Bear, peering in to the GSA conference! At this point, I feel that I have been in Colorado for a long time (well, I did arrive on Friday, and I helped lead a full-day workshop and have had two full conference days with a poster presentation). But I am not done yet! Today it was back to the Colorado Convention Center for more talks, events, roaming around the Exhibit Hall, and to give my own talk. I started the morning by working a two-hour shift at the Council on Undergraduate Research booth in the Exhibit Hall. As an elected councilor with the Geoscience Division of CUR, one of my duties this meeting is to help staff the booth and answer questions about CUR and undergraduate research to those that walk by. I was able to sneak across to the booth of AGI, the American Geosciences Institute. They were giving out pins that say “I’m a geoscientist,” which I am wearing with pride (pictured below)! They also did very short video recordings of people stopping by their booth, asking geology-related questions and posting the responses on Instagram (a use of social media I had never seen at a conference before). Check out my recording! As soon as my shift ended, it was time to walk over to one of the conference hotels for the NAGT & GSA Geoscience Education Division Award Luncheon. At this luncheon, selected faculty are recognized with national awards for innovations and excellence related to the scholarship of and service towards geoscience education. This luncheon is special for me, as it is the same luncheon where I received the GSA Geoscience Education Division’s Biggs Award for Excellence in Earth Science Teaching in 2009. Included in the award recognitions at this luncheon is the GeoCUR Undergraduate Research Mentor Award, this year, presented to Dr. Mary Savina from Carleton College. 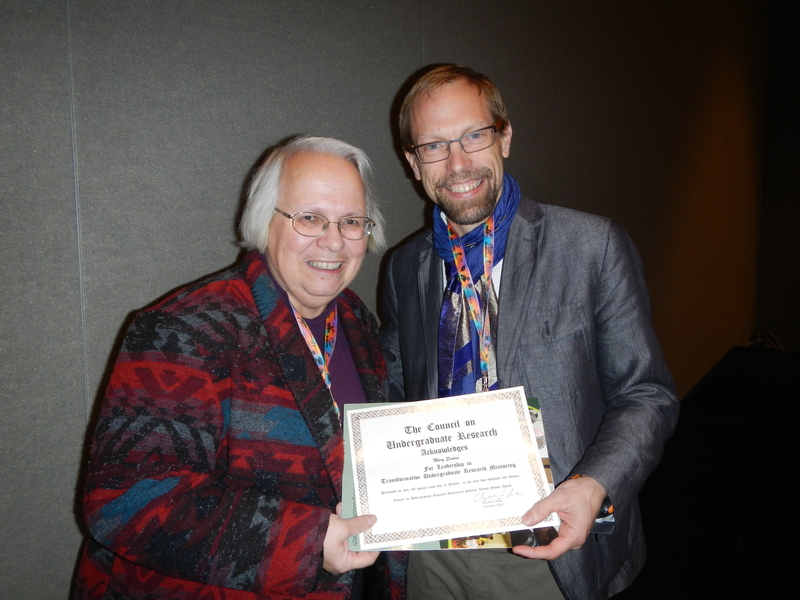 I co-chair the committee that selects the award winner, and I do an interview with the recipient and record a podcast on their reflections of mentoring undergraduate students (podcast and citation for Dr. Savina is here). After the luncheon, I dashed off to the technical session I was presenting in, Innovative Geoscience Teacher Professional Development: Design, Implementation, Evaluation. This session had 13 talks, mine titled Teacher Professional Development Through the Pennsylvania Earth Science Teachers Association (PAESTA). The PAESTA organization was co-founded by myself and Dr. Tanya Furman (Penn State – University Park), and my presentation focused on leadership opportunities for teachers through the organization. I had to rush through my final couple of slides (the yellow light came on, and then the red light! ), but I had several people waiting to speak with me after the talk about PAESTA and how they can become involved – which is great! I’m looking forward to expanding the PAESTA organization with these new connections. My final event for the day was spent attending the GSA Geology and Society Distinguished Lecture: Why People Trust Scientists but Not Science: Climate Denial in Context, by Richard Harris of National Public Radio (NPR). The session description read: Scientists are highly regarded by the public in opinion surveys. But many people don’t accept the broadly held findings about climate change. NPR science correspondent Richard Harris examines this paradox and looks at how it plays out in other areas of earth science. There were many articles and events the speaker addressed that I was already familiar with, from the Six Americas Global Warming Report to Popular Science shutting off the comments feature on their online articles. The final point made by Richard Harris is something to certainly thinking about – he feels that addressing climate change (especially in DC) is not hopeless, but the hard part is what we do about it. We should not be arguing about the science, as we are not really data-deficient when it comes to climate data, but it is more of a cultural/social perception. You would think that I have experienced more than enough from the 2013 Annual Conference of the Geological Society of America – but not yet! There is still one more full day of sessions, and then I am off on a post-conference fieldtrip to the Florissant Fossil Beds National Monument (can’t wait! ).